‘Hello, I can help you spend your money’ hollers one shop owner selling stacks of spices, baklava and Turkish Delight. With a chuckle, I take him up on his offer during a wintery day of sightseeing and shopping in Sultanahmet. There is a light drizzle of rain as we wander through the outskirts of the Spice Market and I note locals outnumber tourists by a long shot – an entirely different experience to a visit in summer. Exploring the city in winter is a delight for those who hate fighting the crowds. There is no sign of queues at any of Istanbul’s major attractions. 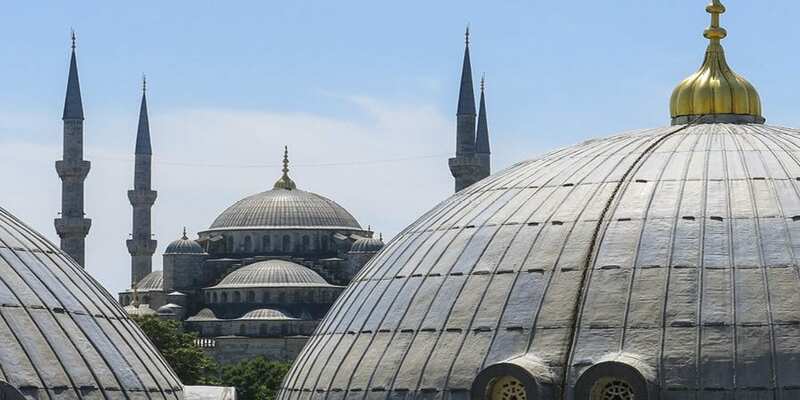 We breeze in and out of Hagia Sophia, Basilica Cistern and the Blue Mosque to name a few. Winning! With a lull in tourist numbers, the cost of additional accommodation is a steal. Extending your Turkey tour with either pre- or post- departure accommodation, gives you more time to uncover Istanbul’s hidden treasures and local hangouts. Think the Rainbow Staircase, bars in the back-alleys of Taksim or taking a ride in the Sapphire 4D Simulated Helicopter Ride in the business district of Levent. For many Antipodeans seeing snow is a novelty (albeit may be quick to wear off once it turns to slosh). When a white blanket covers the city, its such a stark contrast to the summer landscape. The snow-capped minarets, slippy cobbled streets and drooping tree branches struggling under the weight of the snow create the perfect setting to sit back and enjoy a hot çay (Turkish tea). While the architectural and natural sites of Istanbul are a feast for the eyes year-round, in winter there is a totally different vibe. There is a fresh chill at the top of the Galata Tower and the Bosphorus River is lined with frost-bitten hotels and fisherman bundled up in their jackets. Whether you’re a pro with a DSLR or just on the hunt for the perfect Instagram photo, exploring Istanbul in winter is the best time to go. When it’s cold outside, there’s no better way to warm up than with a traditional hamam. This variation of a Roman bath or steam room is a way of cleansing and relaxation in Turkey. It typically involves stripping down to your smalls, enjoying a series of hot rooms and a thorough scrub, followed by a cool down. Etiquette, cleanliness, price and level of service provided is dependent on the hamam or hotel but there are a number across the city of Istanbul. Discover the Best of Turkey on our winter departures in 2016. Itinerary includes an Istanbul city tour before travelling to Gallipoli, Troy, Ephesus, Pamukkale, Cappadocia and back to Istanbul.